STUNNING NEW LARGE ORIGINAL OIL PAINTING ON CANVAS "New York Blend". ..........BY THE AMAZING INTERNATIONALLY ACCLAIMED ARTIST ESCHA VAN DEN BOGERD (Top selling 30 U.K Artists!!!! ).........Her Paintings have been sold to private collections in some of the following countries, Switzerland, Mauritius, Austria, Peru, Luxembourg, France, Holland, UK, US, United Arab Emirates, Germany, Australia, Belgium, Hong Kong, Germany, Ireland and New Zealand. Eschas paintings have also been published by some of Europe's biggest art publishers, her latest work is being published by German publisher International Graphics. Painting is my passion my life, and is about sharing thoughts and emotions with others. My works of art have become extremely personal, they are an emotional response to my surroundings and experiences. These are reflections of joy, hope, peace and sadness.
" An Amazing Blue Chip Investment Opportunity to Acquire an Original Escha Van Den Bogerd Painting" ..
Escha Van den Bogerd - Escha van den Bogerd was born in The Hague, Holland and started painting at the age of 3. In the Hague she attended the Rudolf Steiner school, a school with many art subjects including painting, drawing and art history. After leaving school Escha studied art in Florence, Italy, Salzburg, Austria and her home country Holland. Inspiration comes from many different things, the old masters Caravaggio, Rembrandt, Da Vinci etc. who created a beautiful sense of light. Movies set in olden times and places like Venice, Florence, and the Middle East. But inspiration can also come from people, experiences good or bad and simply just life itself can create new emotions on the canvas. Escha uses a method of painting in which abstraction and figurative images combine and reinforce each other's effect. Her work has delicate compositions and Colour palette of many of the Italian romance painters. The use of wash like technique adds drama and warmth, vibrancy and great emotional power with femininity and sensitivity A refreshing combination of traditional figurative painting in a contemporary style influenced by the many countries she has visited. She is an artist of exceptional intensity whose dynamic and poetic abstraction faces and figurative display profound sensitivity and a great emotional power. Vital in attack and detail and brilliant in colour her energetically composed acrylic paintings radiate an aura of spirituality, which suggests the Middle East and Italian influences, although their formal characteristics are wholly in the contemporary European tradition. Her first painting she sold in the town of Kitzbuehel in Austria where she lived and worked for 3 winters as a ski instructor from 1991 until 1994. Many years of travelling followed to places such as The Middle East, most of Asia, Europe, Australia New Zealand and US. 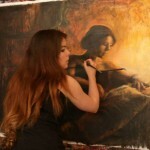 She started exhibiting her paintings in galleries all over the world including New Zealand, Japan, Europe and the US. Eschas paintings have also been published by some of europes biggest art publishers, her latest work is being published by German publisher International Graphics. 2007 Tamarillo Gallery, Wellington New Zealand. 2007 Solace Gallery, Wellington, New zealand.
" The Romance is in the Originals "